While customers love deals and coupon services about as much as they love money itself, merchants — particularly small businesses — tend to see things a bit differently. Often times they feel it’s bad for business (aka the Groupon effect), overloading the retailer with a non-regular clientele, which can make the company look a bit desperate with tacky deals. But Mirth, which has just launched on the Disrupt NYC Battlefield stage, aims to change all that. Because it integrates with a loyalty card system called CardSpring, Mirth only requires a one-time sign-up with your 16-digit credit card number to get started. No app, no check-ins — all you need is your credit card. From there just visit your favorite spots like normal. If you visit the same restaurant twice in a rolling 30-day period, you instantly become a regular, meaning you’ll not only receive 3 percent off every purchase you make, but that the merchant will have a direct line of communication with you. The beauty is that users live their lives just as they normally would, swiping at restaurants with their credit card without ever checking into anything or even opening an app. So let’s put this into a real-world scenario. Let’s say you own a restaurant called FoodCrunch, and I happen to come in about once a week. With Mirth, I’d only need to swipe twice to start receiving discounts, and as long as I continue coming in twice a month after that, I’ll maintain my “regular” status. But for the merchant, Mirth is surprisingly attractive. Three percent isn’t much of a sacrifice; it’s about the same price as swiping a credit card. But the benefits are well worth it. You, as owner of FoodCrunch, can send me an email whenever you’d like to offer me a special discount, or to tell me that you have a new dish on the menu. Mirth gives customers discounts and in turn gives retailers a reliable line of communication to dedicated patrons. Jeremy Philip Galen, Mirth’s founder, conceived of the idea a few months ago and has since brought on Phil Reichenberger as CTO. The company is entirely bootstrapped, and live in New York City. If you want to sign up, you’re free to visit Mirth.ly and enter your info to start swiping yourself to regular status. q: So i def agree with your comment with Groupon and deals. and Foursquare have fixed their model. How are you going to go after that. a: We are going to start with a capable sales force for merchants that are feed up with the current companies. what’s nice with is it’s a it’s a one-time signup. They have very little work to do. q: Local merchants have dozens of companies chasing them. Why sign with mirth? Isn’t there a saturation point at sometime. a: There is probably going to be a saturation point at one time and we’re going to be the one’s that bring it to that point. We’re are going to speak directly to their concerns. Restaurants have been pummeled. They have been very receptive with Mirth with the brand. We are are going to bring the right cliental to the merchant. q: If I show up I look like everyone else if you just send me an email. How I look different as a Mirth user? a: I think it would be an interesting problem to solve if we have so many Mirth users and merchense in a dense geography. We thought a lot about throttling the retailer’s messaging so they wouldn’t be able to send every 10 minutes, only once or twice a week. And then for the customer we thought a lot about letting them specify which types of offers they want to receive. q: How are you doing customer aquications. 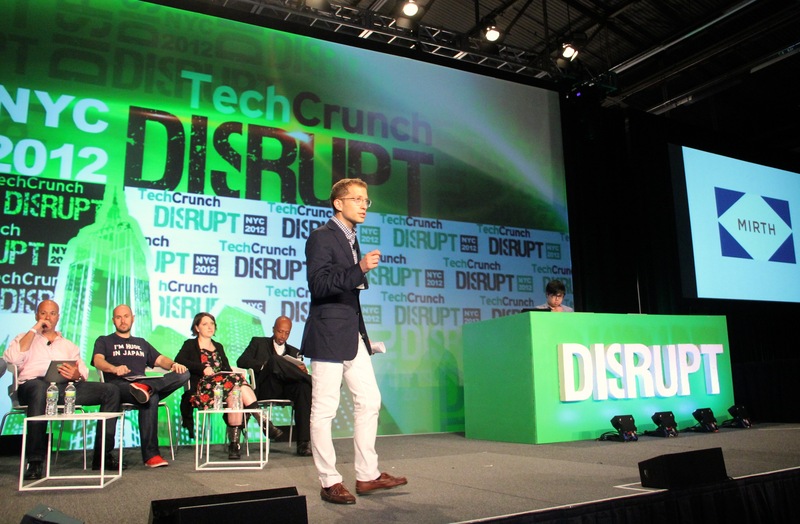 a: We thought we would launch at tc disrupt and see if anyone signed up. Second thing we are going to deputize our lovely merchants. They have an interest to promote this program. We believe they can genuinely give this to first, light users. And then bring them into the program. q: Can you elaborate the discount model? a:The discount is considerably smaller than the deal discount — 3% at a restaurants. Including our small fee, it’s the kind of small discount that will trigger loyalty logic and give the type of lift loyalty can offer. q: Have you had any friction on people giving you their credit card info? a: We are launching right now. q: So real quickly, the value for the business will be loyaty and foot traffic. So how are you actually increasing the foot traffic? a: We are not bringing new customers, we are giving businesss an opportunity to take the first time customer and getting them back again. And the second and third customers and bringing them back again.